Alhamdulillaah, school is set to begin for many schools and homeschoolers. The beginning of the school year is a very important time for many reasons. It is during the first weeks of school/homeschool that students learn new routines that will help contribute to a positive learning environment. It is also during the first weeks of school that teachers/parent-teacher set expectations for the school year. These first weeks are critical then because they often set the tone for the entire school year. 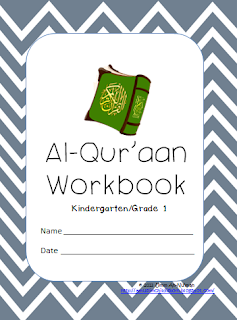 To help set a tone that is pleasing to Allaah, SK/Kindergarten students can work on this Quraan workbook (*Note: some SK/Kindergarten students may not be ready for the materials in this pack - you as the teacher/parent-teacher will need to determine this). There are 3 rubrics included for each type of writing students will do, 3 student editing sheets - with these students self-edit prior to submitting their work with the happy proclamation that it is 'done'. Make a plan for the suwar they will read from al-Quraan and start to take ownership in making sure they read the Quran daily insha'Allaah. Are you ready to start school? Then let's begin insha'Allaah! Click on the picture above to download the workbook insha'Allaah or you can download it free from the Teacher's Notebook store! So cute! Jazakillahu khairan for sharing your hard work! Subhanallah, Jazakallah khaira for sharing these wonderful resources. it's wonderful, Masya Allah. Salam, it is a nice and innovative effort. JazakAllah..
Mashallah, Nice work. Could you send It to me in another format for nr to translate to My Children. Am interested in Quran. Akhlaq, Islamic History activities etc...Teach at Sunday school.